It has been almost two years since my last Arbatel rite to the Olympic spirit of Phaleg. For me these last two years were packed with learnings and explorations, mainly into the field of visionary magic as taught by Josephine McCarthy. These months gave me so many opportunities to practice, I was pulled into so much magical work that deeply affected my life and that of others - I wonder if it is an exaggeration to say they left me a different person altogether? Well, they certainly left my magic as something very different altogether. I am grateful beyond words to Josephine for all her books, her advise and humour during these years that allowed me to change and develop in ways I would not have anticipated. Front and back piece of the lamen and the liturgic book. click to enlarge. So as I returned to continue the Arbatel cycle with this sixth ritual I needed to evaluate my approach to this Grimoire and how it needed changing in lights of the experiences made. As stated before, the instructions given in the Arbatel itself are incredibly reduced and straight forward. Possibly this is because of the missing chapters in the book that never were written or at least handed on to us? So what we are left with is the bare minimum of the description of the Olympic spirits, their nature, seals and invocation prayers. However, providing the bare bones of a ritual approach - or even less than that - clearly is the nature of all Grimoires. So we never get away without finding our own approach to contacting their spirits and taking our own calculated risks on the way. Exploring the unknown territory based on such an incomplete map is the work of the magician - and what sets it apart from pure repetition and dead traditions. Firstly, I assume familiarity with the techniques described in Josephine’s series ‘Magical Knowledge 1-3’. That means I won’t go into explaining what it means to perform a contacted ritual or to perform ritual actions mutually on the Inner and Outer Realm. Secondly, I won’t be able to share all the elements that were essential to performing this rite in the way described. That is mainly because I cannot share details of the place, setup and dynamics of my (inner) temple. Anybody aiming to build their own ritual approach to the Arbatel based upon the experiences shared here, they will simply need to walk the entire path themselves, both on the inside and outside. The importance of magical teaching and guidance has never been more obvious to me; which is why not being able to share all of these details is equally unfortunate as important. For months I had prepared this rite, working my way in circles closer and closer to it. Preparation began in summer 2013 when I partnered with a land being who had moved into my backyard. Over the course of spring this being - let’s call it B.:. - had taught me a lot about how to work with the forces of nature. It wasn’t very talkative at all. Instead it was extremely pragmatic and focussed to build out a specific land-related project for which it needed my help as well as the ground I live on. Often, however, when I would go out and contact B.:., it would be busily sleeping in the earth or telling me off for coming around at a time when it couldn’t make use of my (limited) skills as a human in the work it undertook. B.:. had expressed interest in working with the forces of Bethor under specific circumstances: He made it clear that under no circumstances could I personally bring the forces of Bethor out into the land myself; instead I needed to find a container that could store such power and hand it over safely to him. B.:. would then take care of embedding the forces of the Olympic spirit into nature as appropriate for the land. First I considered several man-made containers for this purpose - such as clay pots or horns filled with beeswax and anointed cloths to be buried in the ground behind my house. Such tradition had existed in the land I live on for many centuries; it was even well known amongst farmers to to feed the spirits of the land… However, Josephine was pointed out that I should rather follow B.:.’s instructions directly and find the most powerful container - instead of the one that fulfilled best my magical DIY desires. The most powerful magical containers of course are made by nature itself; the rawer the better. Thus I picked up a large stone on one of my frequent walks through the local woods and placed it into the North quarter of the temple weeks before I performed the rite. the chalice filled with sparkling wine. In addition I hung up my magical robe and positioned the completed lamen, the magical belt and ring on the floor below it. Of course it takes years bringing together all these things; no one can rush this process. One does not work to build one’s magical paraphernalia in order to do magic, they are the foundation of one’s magic. Once these containers of power are created and charged, preparing rites like this becomes easy at least on the physical level. When all of this was done I shaved carefully and took a consecrated salt-bath to clean my body and mind of all energies unrelated to the ritual. Then I walked naked into my temple, ready to work. On the outer level the rite was set up exactly like the five previous Arbatel rites I performed before. Once the inner and outer temples were shining and buzzing with energy, I opened my eyes and focussed to be present in both realms at the same time - inside and outside. At this stage a strange feeling overtook me: it was the deep conviction of being completely ready for the actual rite in this very moment - without putting on any robes or magical belts or lamens, without any additional prayers or incenses lit. The forces were literally pulling on me and I needed to concentrate really hard to stay on the path I had laid out for this rite before. When I walked into the corner of the temple and touched the robe, I immediately understood why it would have been folly not to wear it. The insight just hit me and I could see exactly in the inner temple what happened when I put on the consecrated robe: I disappeared within it. My body and inner being immediately were veiled behind the shining power of the robe. Instead of myself what was left being visible and walking through the temple resembled a living, shining mirror - too bright to show anything but the light reflecting back from it. This robe was a device of protection and what it protected was this fragile pattern I called ‘myself’. It shielded me from the magical energies about to enter this temple; forces that weren’t meant to interact with humans without many astral filters and layers in-between. Walking into this rite without such protection would have been similar to walking into a chemical laboratory without gloves and a full body suit. Your passion as a scientist, the love for your work won’t make any difference to how a virus will affect you. Just because you honor and respect the force you are about to encounter, doesn’t mean that your body can carry it - nor that it won’t destroy you, should you chose not to protect yourself from it. Putting on the robe that evening in the temple was a powerful reminder: True magic is the science and art of mediated contact. Take out the word ‘mediated’ and you are on a direct path to blowing yourself up for good. I stood in front of the altar and anointed the lamen of Bethor. Putting it on immediately embossed the pattern of the spirit in the bright, virgin energy the robe had veiled me in. From a naked person entering the temple I had transformed into a spirit interface resonating and echoing the being of Bethor whom I was about to evoke. Only then did I fully and even on a physical level understand what it means to be a priest. The contacts surrounding me in the four quarters realised this change as well and their presence and quality changed: They now could read the pattern of forces I was about to call. Their expression changed from present and gentle into watchful and alert. By the time I had performed the Pentagram- and Hexagram-Rituals a few further things had dawned on me. These types of rituals - as simple as they may seem - were never meant to be performed from one side only. A magician standing in their temple drawing the signs and uttering the divine names was only one side of the coin. The other was waiting for us in the inner realms - rarely discovered and actively worked with by magicians these days. However, when I performed the rites the contacts of the quarters were just as actively as myself: The utterance of the divine names worked like a key that activated their forces as well as mine - and so the Pentagrams and Hexagrams were charged from both sides. In this way the centre of the temple, along the circumference of the magical circle turned into a vacuum shielded by a wall of power from both sides. As during the previous rites I further inclosed myself in this vacuum by extending the magical wall into a sphere of power shielding the inside from the outside. The hexagrams activated by the sigil of Bethor formed a shining ring on the inside of this sphere. When I spoke the Arbatel prayers I realised again how stupid it would have been to change any of them. It was completely obsolete wether I myself believed in God with a capital 'G' or in Jesus Christ as his son. My inner relation to these concepts was meaningless at this point for as long as I could step back as a person and completely handover power and actions to the priest of Bethor who I had become. Him uttering the prayers had a similar effect on the space I was confined in as building up the power structure by use of the hexagram rites: The divine names brought strength to the structure which confined the inner vacuum that was about to be filled by the forces of Bethor. It dawned on me later on, long after the rite was passed why this mattered so much: The Olympic spirits are not meant to be present in the physical realm unfiltered. They are forces beyond the world of creation that manifested on this planet. Calling them down unfiltered, establishing a physical space for them on earth was a very dangerous act that easily could impact and unbalance creation around it. This was true for their impact on the inner as well as the outer realm; in both realms performing this rite meant for these spirits and their forces to enter a space they weren’t meant to be in. Equally the space they were called into wasn’t intended to hold such capacities of immediate power; therefore it needed protection and strengthening. And a lot of it. This was exactly what the Pentagram- and Hexagram-Rituals were meant to provide, just like the confinement through divine names, the magical circle, the contacts holding up this rite from the outside, etc. Bethor descended slowly through the tunnel at the top of the temple. It needed a lot of concentration to perceive his shape and form. At this stage I was trembling and sweat was running down the back of my legs. Suddenly the actual role of the black mirror became clear to me as well - but it would take too long to explain this here. Every practitioner will find out themselves; and its function might even alter between magicians depending on our psychic makeup. After a while I could see the geometric form of Bethor clearly, hanging above me in the bright light of the temple and slowly turning as if moved by an invisible wind... I began to speak with the spirit. B: I am growth and expansion. I am a new birth just as I am death through exhaustion. I am the echo that repeats a pattern. B: The legs, the water. A: Which substances in Alchemy do you govern? B: Putrescence, Fermentation and Dew. A: What is the geometrical shape that you govern? A: What is the nature of divine grace? B: Think of it as a breath or a wave in constant expansion without any shores that could stop it. A: What decides if your influence has a healing or destructive effect? B: The resonance of the substance I get in contact with. Expansion without balance through structure will create destruction. A: What is the state of your powers on Earth today? B: I am being abused. Humans abuse me just like they abuse diamonds. They control and funnel my expansive powers into places where I don’t belong. They create imbalance. A: What is the state of your forces within myself? A: How can I mature your powers within myself? B: Use my forces like the skin on a drum; hold me tight. Stretch my forces over the frame of your mind. Then see how life is beating this drum; follow its rhythm and remain in resonance. A: What is your relation to the Sephira of Chesed? B: The Sephiroth form the skeleton, the husks of creation; we (the Olympic spirits - ed. Acher) are the movement within these shells. We bring life and yet couldn’t bring it without the patterns of the Sephiroth. Think of the Sephiroth as the strands of DNA; we are the spirits that create life from it. We reside inside. A: What is your relation to the Olympic Spirit of Aratron? B: We interact like a body breathing in and breathing out. I initiate movement, Aratron ends it. Where I expand, he confines. B: Your angel makes me small, like all angels do. They confine me, take sparks and drops of my forces and mix them with the patterns of the other spirits of creation. If I am allowed to I will extend into all directions; your angel creates alignment and adjustment. They are bees-carriers of life. A: What is a bees-carrier of life? B: Every angel. We (the Olympic spirits - ed. Acher) form the superstructure of creation; without us nothing will ever exist on Earth. Yet we all stand separated through space in our own spheres. We do not mix or mingle by ourselves. We are mixed and mingled by the angels, every time a new being is created. A: Which force governs you? B: Every angel can take from me; think of me as a well. A: Which sacrifice do you want from me? B: I want to use you as a husk of my force. Of course I couldn’t have that - being used as a container of pure divine forces comes with consequences I certainly needed to avoid. Thus I apologised to Bethor that I couldn’t offer such sacrifice. Only in that moment did I recall the stone in the North quarter which I had brought in for my work with B.:. weeks ago. Thus I offered to Bethor to use this stone as a container instead. The spirit was very willing to accept this sacrifice. From the middle of the temple, from the centre of the geometric sphere a ray of bright energy shot into the stone. For a while the ray of energy hung in the air, solid like a bridge from one being into a different one, from spirit to stone. When the stone was fully charged Bethor withdrew again into its slowly rotating sphere in the middle of the room. I picked up the chalice, humbly thanked Bethor for its presence in the temple and the communion I was allowed and drank the sparkling wine I had brought for it as an offering. Immediately the boundaries between the spirit and the priest I had become turned weaker, they almost became translucent. I wondered if it had been a good idea after all to bring this wine and drink it in dedication to the spirit? After all it crossed the threshold the robe and lamen established and allowed the forces of the spirit to enter into my physical body. However, I had learned that approaching any spirit without offerings was a really bad idea. At this point I decided drinking the wine simply was a way of disposing it while still in the ritual sphere… Time would prove if it was more than that. 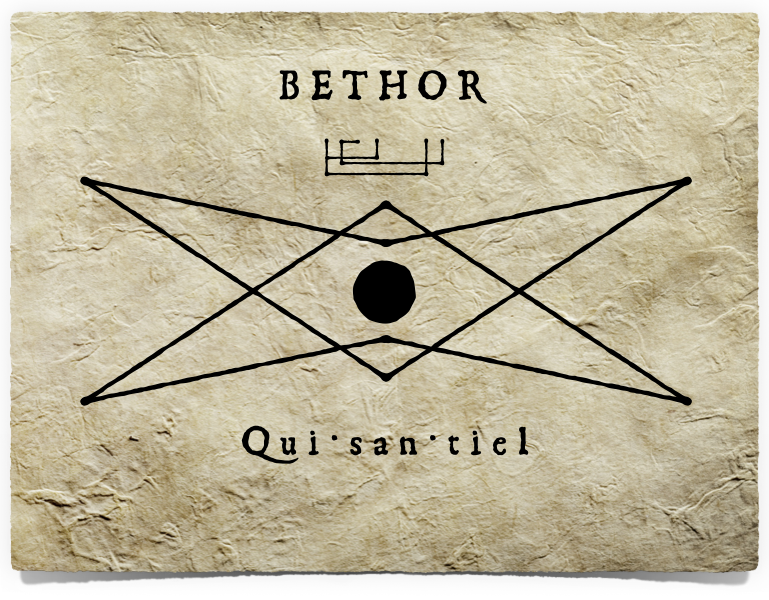 Finally, I thanked Bethor again, performed the gesture of the closing of the veil and began the banishing Pentagram-Ritual. As I performed the ritual it was plain visible how the contacts of the quarters helped to dismantle the spiritual structure we had established in preparation of the rite of Bethor: They charged the Pentagrams from their end, breaking open the sphere previously erected by the Hexagrams and maintained by their own and my powers while Bethor had been present. Towards the end of the short ritual each quarter was unbound again, vibrating in its own substance and force; the powers of Bethor had withdrawn through the dark tunnel in the roof of the temple. More than during any of the previous Arbatel rituals this one had taught me how powerful and potentially dangerous these beings were. In fact, it needed to be asked if they were ‘beings’ at all - given that all beings were only created through the weaving of their essential forces. If the four elements are the spirits and substances through which everything created is veiled into physical and astral shapes, then the Olympic spirits are what creates creation itself. It is through them that each divine impulse is initially formed into a spiritual being; everything bound to flow into creation receives its particular pattern of being through the forces stored in these seven divine bodies. It is through the Olympic spirits that each divine spark is veiled into its spiritual body. Again, if you have read the books of Josephine McCarthy you will be familiar with these forces: They are what you encounter when walking into the desert from the edge of the Abyss. They are the forces taking the divine breath and helping it to transform first into a spiritual, then into an astral and ultimately into a physical form. In this process, however, they always remain passive - like an unmovable light, shining fixed in its assigned space, like a well, never judging, offering its force to anything passing by. It is the assigned angels who make use of them, who move and weave and build from their pools of resource and being - in order to bring new beings to life. This is why a magical evocation of the Olympic spirits isn’t without risks. In fact it is a very different ballgame than evoking angels, i.e. messengers (or bees-carrier as Bethor had said) who move between the fixed wells of creation as embodied by these planetary beings. Bringing down the Olympic spirits pretty much is like plugging your fingers directly into the socket: What you get is access to a lot of very specific, yet completely unfiltered power. What you open up is a gate to the forces of creation itself; one of the seven containers at a time. It has to be said though that these spirits don’t understand humans any better than humans understand themselves. They don’t offer ‘truth’ - for whatever that would be. Yet, they offer a very specific and precise view on how their own forces have been woven into what now has become a full being in its own right - may it be a human, a stone, a temple or the land we live in. What they offer is the dissecting view of the scientist right into their specific own patterns, the threads of powers that originated once from their pools of unshaped force - and now have grown into the flesh and bodies of the spirits we call ourselves. It is because of the nature of these spirits why the mage should never try to manipulate them. In fact it is advisable not to work directly with these spirits at all; better rely upon the intelligence and skills of angels who hold millenials of experience on how to harness their powers in order to impact creation constructively. When the magician brings down the Olympic spirits into their temples it should be for one reason only: to enlighten their own mind with better understanding of how this world works. And then to get out alive again.